Lock in a great price for Candlewood Suites Paducah – rated 8.7 by recent guests! Miss Dina was so friendly and helpful. We booked 2 rooms on line but when we arrived the booking had one sent a reservation for 1 room. She quickly resolved the issue and got us 2 rooms side by side. Loved having a kitchenette in the room. And room to move around. Requested specific location in comments and were accommodated. Friendly staff and the good location of the hotel. was pleasantly surprised. The room was clean and it was nice to have a everything a suite could offer. Plenty of room and it looked as though it had been completely renovated recently. Good stay. I stayed here for the quilt show! quilt is by Molly Hamilton. The room was nice. The bed was very comfortable, and the girl working Megan was very friendly and accommodating. The room was newly remodeled and extremely comfortable and quiet. The staff could not have been more courteous and helpful. The kitchenette was well stocked and it was great to have a full size refrigerator. great place. friendly staff despite the renovations. Dina Ray was amazing!!! my 4 year old and 9 year old loved it!!! Hotel was in a good location for restaurants, venues, shopping, etc. Just feels like staying in a home setting instead of hotel room. What a joy to have real dishes. 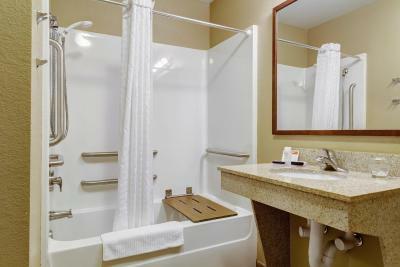 Candlewood Suites Paducah This rating is a reflection of how the property compares to the industry standard when it comes to price, facilities and services available. It's based on a self-evaluation by the property. Use this rating to help choose your stay! Located in downtown Paducah, Kentucky, this hotel is just minutes from the AQS National Quilt Museum and the Carson Four Rivers Center and features rooms with fully equipped kitchens. Guests can use the on-site barbecue grills and the picnic area. There is also a business center and a 24-hour fitness room. In each suite, guests will appreciate a CD/DVD player, a coffee maker and free high-speed internet. There is also a dining area and a living space. Free parking is offered at Paducah Candlewood Suites. The hotel is a short drive from the historic downtown area, where Floodwall Murals tell the story of Paducah. The River Heritage Museum, featuring interactive exhibits, is also nearby. When would you like to stay at Candlewood Suites Paducah? Features a spacious seating area. This studio has a kitchen, cable TV, a sitting area, and a work desk. This suite features a kitchen, cable TV, a seating area, and a work desk. This studio has a satellite TV, seating area and air conditioning. This studio has a tiled / marble floor, air conditioning and satellite TV. This studio features a dishwasher, dining area and tile/marble floor. House Rules Candlewood Suites Paducah takes special requests – add in the next step! Candlewood Suites Paducah accepts these cards and reserves the right to temporarily hold an amount prior to arrival. Very clean & room had all the amenities. Location was great it was off of our interstate. Food and beverage room was too limited. No non-flavored half and half for coffee. Very clean and comfortable room and beds. No breakfast and no extra blankets. But it was fine. Great Staff. Everything was nice and clean. The pet fee should be conditional or lower. My dog does not shed and is completely house broken. She left the place cleaner than some humans may have. Excellent value for the price. Clean, friendly, and easy access from the interstate.